The PDF of this book is licensed under a Creative Commons License and you may pass it on electronically for free, but it must not be copied for sale. In the immediate aftermath of a global financial crash it is hard to imagine great progress, as it also was after the crash of 1929. What I suggest here is in many ways much less imaginative than setting up a National Health Service would have sounded in 1935, or the suggestion also made at that time that full employment was possible in the near future – but both of those things happened. Most of the policy proposals I put forward are not fully polished. Some might turn out to be unworkable, while others may not seem bold enough with the benefit of hindsight. None of us can know for sure what proportion of what we suggest will turn out to be misguided, or where we might have hit the nail on the head. That is often only apparent in retrospect. What is certain is that there is no shortage of evidence, ideas and choices for us to consider if we wish to. There are many policies that we could adopt if we really want to be collectively happier and healthier. 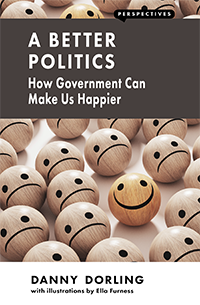 We could have a government that makes our lives happier, if we win the argument for it.